Victor Pineda travels the world to make speeches and advise governments on urban planning and development. But when he encounters a touch-screen kiosk, he’s stymied. For people like him, who use wheelchairs and have limited use of their hands and arms, displays like these are a barrier rather than a convenience. It’s a problem that’s only getting worse as cities adopt such terminals to substitute for human cashiers and receptionists. “If a kiosk is the only way I can buy a train ticket or pay for a service or get information, I’m excluded from that,” says Pineda, who heads the consulting group World Enabled. People with disabilities affecting mobility, vision, hearing, and cognitive function often move to cities to take advantage of their comprehensive transit systems and social services. But US law doesn’t specify how municipalities should design and implement digital services for disabled people. As a result, cities sometimes adopt new technologies that can end up causing, rather than resolving, problems of accessibility. Nowhere was this more evident than with New York City’s LinkNYC kiosks, which were installed on sidewalks in 2016 without including instructions in Braille or audible form. Shortly after they went in, the American Federation for the Blind sued the city. The suit was settled in 2017 and the kiosks have been updated, but Pineda says touch screens in general are still not fully accessible to people with disabilities. Also problematic: the social-media-based apps that some municipal governments have started using to solicit feedback from residents. Blind and low-vision people typically can’t use the apps, and people over 65 are less likely to, says James Thurston, a vice president at the nonprofit G3ict, which promotes accessible information and communication technologies. “Cities may think they’re getting data from all their residents, but if those apps aren’t accessible, they’re leaving out the voices of large chunks of their population,” he says. Adriana Mallozzi, a technology entrepreneur who lives in Boston, says she loves the city but gets frustrated when it deploys technologies without exploring how they could help people like her: like Pineda, she uses a wheelchair and has trouble using her hands and arms. She struggles with the buttons that cities install next to doorways and intersections to open doors and activate crossing signals, for example. “A lot of the buttons are oddly placed,” she says. “I’d have to kick my foot in a very specific place to activate them—and they’re often blocked by things like decorative plants, so I can’t get close enough to do that anyway.” A smartphone app would be a better way to deal with such needs, she says. Cities could also use technology to make commuting safer and more predictable for people who have cognitive disabilities, says John Blascovich, the president of the Matthew Foundation, a nonprofit that seeks to improve the lives of people with Down syndrome. “Typically, these folks have memorized what bus to get on and how many stops to go, and if the route changes or the bus isn’t operating, they run into problems,” says Blascovich, whose son has Down syndrome. He’d like to see an app that tracks transportation delays and detours in real time and advises users, through a smartphone or wearable device, on how to handle the route changes. Some of these technologies aren’t far off. People who are blind can already use their smartphone’s screen reader to operate transit apps like Moovit. The app, which helps plan trips on public transportation, alerts users when buses are arriving and gives step-by-step directions to their destination. It also notes which routes are accessible by wheelchair. The startup Aira makes wirelessly connected smart glasses that enable blind people to navigate complex interior spaces with the aid of remotely located, sighted “agents.” At $1 to $1.50 per minute, the service is pricey, but it’s available free at some Target and Walgreens stores and 30 airports in the US, as well as Heathrow Airport in London. Even for city officials who have these issues on their minds, knowing where to begin can be difficult. 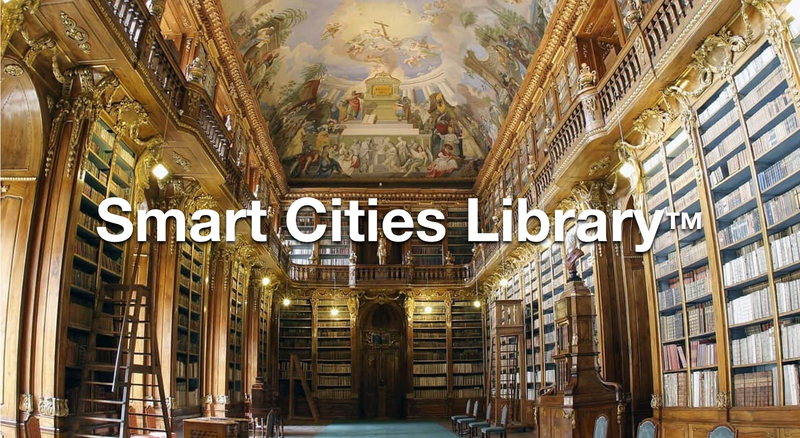 Smart Cities for All, an initiative led by Thurston and Pineda, aims to help by providing free, downloadable tools that cities can use to analyze their technology and find more accessible options. One is a database of hundreds of pre-vetted products and services. Among the entries are Cyclomedia, which uses lidar data to determine when city sidewalks need maintenance, and ZenCity, a data analytics platform that uses AI to gauge what people are saying about a city’s level of accessibility. This month, the group will kick off a project working with officials in Chicago to grade the city on how well it supports people with disabilities. One key part of the project will be ensuring the accessibility of a new 311 phone system being introduced as a general portal to city services. The group has plans to expand to several other US cities this year, but its ultimate aim is to turn the work into a global movement. It’s met with governments in India and Brazil as well as Sidewalk Labs, the Alphabet subsidiary that is developing a smart neighborhood in Toronto. What is the future of work when AI, automation, and on-demand services are altering how we define what a job is and who qualifies as an employee? As the senior editor for business, I’m focused on writing stories that explore this important question.… More Other areas of interest include new models for workforce training and education, how companies are increasing employee diversity and inclusion, and startups that are developing innovative workplace tools and technologies. I began my career at Time Asia, followed by staff jobs at BusinessWeek and Forbes. More recently, I co-authored an e-book for O’Reilly Media about the gig economy and wrote a book called The Smartphone: Anatomy of an Industry, which was published in 2014.